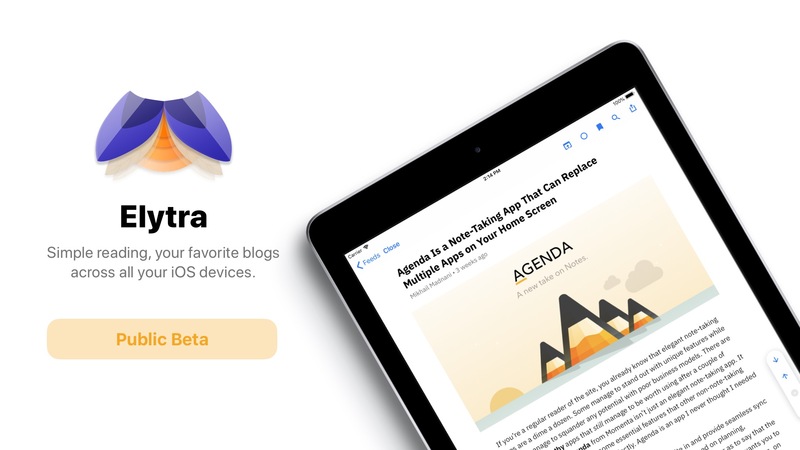 Elytra – Page 3 – The simple RSS Reader. This blog publishes release notes, engineering and design details. A warm welcome to all the new Public Beta Testers. Now that the cheesy stuff is out of the way, let’s get to the meat of this release. Added a “Open in browser” button to the Article interface. Improves the tinting of the refresh control for dark interfaces or after switching the theme. Improved the kerning for the System font for the Article’s title. Vastly improved GIF performance and memory consumption thanks to the FLAnimatedImage library. Fetching an favicon across all the available images (opengraph, apple-touch-icon and the favicon itself) based on weights. Apple-touch-icon is given a higher preference over the favicon now. When adding a new feed from the app, typing in http/s is now optional. When a feed has multiple endpoints, the list now uses head truncation so you don’t accidentally add the comments feed. Fixed adding feeds from the share extension. Fixed the position of the popover (iPads) for the long tap interaction on feeds and folders. Added a default handler for the browser scheme when one isn’t selected. Fixed an issue where all buttons would remain in the disabled state if the cancel button in the Purchase interface was tapped during first run. Searching within an article should now work as expected. There is a known issue on iPads where the highlight doesn’t align with the characters you’re searching for. Fixed a rare crash that would occur when dismissing the Unread interface while a page was loading. If you remember the early alpha days, the anonymous account management thing created a lot of issues you and I. Well, that’ll no longer be the case. This has been moved to a more concrete system. However, do note that this may not correctly work on first run, so I recommend you to copy your account ID and keep it handy incase you need to restore your account. There’s a new launch screen that guides you through your anonymous account setup process and subscription setup. During the betas, you won’t be charged for the subscription, so please go along with it. If you do get charged (Apple! ), I’ll send you cookies worth the same amount. Access restrictions are in place when a subscription expires or lapses however they won’t be effect during the betas. They’ll get activated once the app releases on the App store. Animated GIFs now require you to tap on the GIF button to load the image and then the play button to play them. This is done so as to deter the usage of GIFs and save precious power and CPU cycles. When adding new feeds, a visual dialog is now added to let you know that the app is processing your request. Gallery items now correct announce captions for images when VoiceOver is enabled. Fixed an issue where labels of certain buttons were read incorrectly or mixed up. Fixed an issue where Voice Over sometimes did not correctly read the title of the active interface (usually occurs for modals). Fixed loading of bookmarks from the server during post-setup syncs. Fixed an issue where the “Move to Folder” interface used to show a checkmark against None even if a folder is selected. Fixed empty states not appearing correctly on some devices. Fixed the Author’s interface showing articles from all authors from that Subscription. Fixed a caching issue that caused old caches to be displayed instead of the latest information from the server. The betas are coming to end soon. But this isn’t the last one. Not one bit. It is an interesting one nonetheless and builds on the previous beta release. You can read that here. Added new fonts: Helvetica Neue, Merriweather Serif, IBM Plex Sans and Plex Serif and Spectral. On iPads with an external keyboard connected: major parts of the app are navigable via the keyboard directly. More information below. OPML imports and exports are now available. Updated the Share sheet icon. Empty states are now shown where appropriate. GIFs are no longer loaded and played by default. To load, tap the GIF icon in the bottom right corner of the image and to play it, a new play pause control is added. This is to prevent excessive power consumption and bandwidth usage. Videos are now supported when the video format is supported by the OS. In the Feeds or Feed interfaces, use the arrow keys to focus the previous or next item. Use the Enter key to select the focused row. In the articles interface, the up and down arrow keys are used for scrolling. Use ⌘ + up or down arrow keys to navigate between articles in the articles interface. Use the left or right arrow keys to navigate a gallery when it appears on screen. Other available options can be viewed by long pressing the ⌘ key on the keyboard. Fixes bookmarks loading from the network again. Bookmarks are mean’t to be available offline. Fixes checkmark appearing in the Folder selection interface for the None row even though a folder was selected. Fixes background colour on the Feeds Interface header visible in landscape orientations. Fixes app not working when iCloud Drive was not enabled on a device. The Mark All Read button now only sends articles which are unread for marking. Reduces network usage. Over the past few weeks, I’ve been carefully developing test suites for Yeti which simulate a few scenarios like: casual users, power users, long-form readers and the like. Over all the test suites, one thing stood out: The obscene amount of power wasted in downloading content which was never read in these simulated situations. Your bookmarks are synced. Any new bookmarks are downloaded. Permitted that there is a network connection available, there’s a lot of data transmitted over the wire. Your phone’s modem is responsible for loading this data consuming considerable amount of power. When this reaches the CPU, it converts the data to Elytra’s internal model structures and is cached in the RAM. However, in all of the simulated tests, not all articles were read. This lead to a lot of data that was never used. So to reduce this waste, I first decided to make all unread articles load with the content. This was a good first step. To improve this further, I tested again by returning no content on any of the articles. In both of these cases, the articles were loaded on-demand when the simulated user opened the article. Here’s how the CPU was impacted. As you can see, stripping the data from the articles and loading it on demand saves a lot on the CPU processing power. Modern iPhone and iPad CPUs like the A10, A10x and A11 are really power efficient, but if the app can avoid any kind of overhead, it’s always worth stripping it off. Similar trends can be observed in Wireless data consumption. By stripping off the overhead, a lot of unnecessary data was avoided from being transmitted, and therefore loaded. This not only saves power, but also saves bandwidth on your devices and this is especially critical if you’re on a metered connection. This also saves me some $$ on server bandwidth costs. A 8 times reduction in data costs is a huge gain. All these data points are aggregate averages across the various test suites. As you can imagine, reducing CPU and data usage considerably impacts power consumption. This is not only great for your device’s battery, but also an invisible user experience benefit. It’s immediately evident that this was a step in the right direction. Not only do we all save money, bandwidth and time, but also should be able to use our iOS devices for a few charge cycles more or at least that’s the vision. The dark themes no longer cause jumpy navigation bars. There is a basic implementation of In-App purchases. You can try it out. This won’t affect anything in the app. Also, you aren’t charged during the Testflight run. Improves memory management for long form articles. Implements Cover images for articles that provide this information. Fixes line height of headings. A few minor bugs slipped through the first beta. So this is a house keeping build that fixes some of those issues. On iPads with enough horizontal space, the article helper view is aligned to the right. I’m still figuring out how to work this in RTL modes. When an article specifies a linebreak, Elytra’s text engine added extra space before and after the linebreak view. This is no longer the case. Fixed an odd line-spacing bug that popped up in iOS 11.3.1. Foot links scroll jump to section has been fixed where it never flashed the background colour to indicate the highlighted paragraph. Fixed a not so rare crash that would occur when removing an article from your bookmarks. Something is off? Something doesn’t sound right? Something doesn’t look right! That’s it, it’s the new name and App icon. 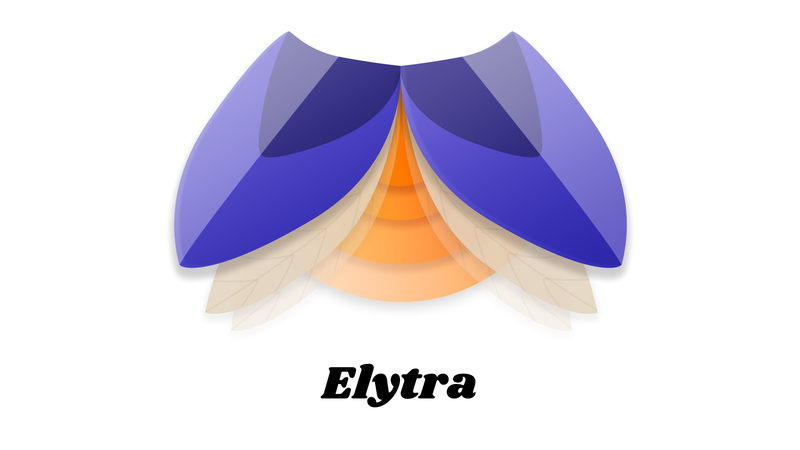 Yes, Yeti still remains our internal codename however, since this is the first Beta build, I couldn’t think of a better time to finally reveal the actual product name we’re going with: Elytra. There’s also a new domain name. An .app domain. I’ve been waiting to acquire this domain so I can finally release the Beta. Black Theme for iPhone X.
Serif type (Using Georgia at the moment, please email me your font suggestions). Lowered disk usage (and therefore lower power consumption) when a post has lots and lots of images. Image galleries are now accessible including controls. Improved “Add To Elytra” (previously, “Add to Yeti”) share extension. Moved the Article Helper interface to the right edge on iPads. It moves to the left for RTL idioms. Galleries with images with no height information are now rendered correctly. Galleries with more images than what can be fit horizontally (page control) are now rendered as groups of 5 photos per control. The Title & author text is now aligned correctly with the rest of the text in the article interface. Fixed the “Add to Elytra” (previously, “Add to Yeti”) share sheet extension crashes. When using a dark theme, the navigation bars will misbehave and present a lot of unexpected states and behaviours. When searching inside an article, the highlighted area is often mis-positioned to the left or right (this depends if you’re using a LTR or RTL idiom) however, scrolling up or down a little positions this highlight correctly. The final epoch has been rung. Fixes a crash when an article has a lot of content. Like, over 10000 words! Attributions page is now fully functional. The final alpha build is out. I look forward to hearing from you lot on the new improvements. As I now slowly work towards polishing the app up and work on the macOS app, I look forward to your criticism, feature requests and love/hate emails. Have a fun weekend, and enjoy reading. I suppose I underestimated myself when I wrote this. Authors: Supported publishers have been enhanced with author support. This is currently limited to http://macstories.net and http://sixcolors.com. If you’d like to see support added for your favourite publisher, get in touch. You can now view all posts by a single author and tap on the ⦿ to view information about that author. Author bios in the article interface has been scrapped. Push Notifications: Push notifications based on WebSub are finally here. At the moment, only this blog supports Push notifications. As more and more publishers begin supporting WebSub, this list will expand, and automatically. Just find the bell icon in the Feed Interface. If it isn’t there, the publisher most likely doesn’t support WebSub at the moment and therefore, push notifications won’t be available. Filters: Maybe it’s Game of Thrones release time and you’d like to completely avoid all spoilers. You can setup keywords under Settings > Filters and these will apply throughout Yeti. Once you add new filters or remove existing ones, don’t forget to refresh your feeds. Improved accessibility labels for the “Mark all read” button making it more descriptive. Fixed rendering of <aside> tags from certain publishers. Some articles wouldn’t display embedded images. This has been fixed. Improved quote rendering on iPads. Fixed a rare crash that would occur on the iPad Pros (2017) when marking an article as unread. Improved sync speed for bookmarks. Also, major news: this is the penultimate alpha build of Yeti. After the next build, I’ll be starting work on the Beta feature set (which is small, but contains a larger locale set for testing on my end). Once the alpha run is over, I’ll be freezing the spec on my end for the server side parser. This is going to enable me to enable publishers to add new meta tags to their article pages to customise rendering aspects inside Yeti. This is the major component of the beta run. Which means, there will be fewer beta builds, once every 15 days or so. Until then, enjoy the alpha. Have fun reading! We all hate delays. Especially when it comes to airplanes and commercial flights. But this is alpha-grade software. Today is Friday. You’re most likely not waiting for a new build notification to pop up on your screen. I’m not even sure why this turned out to be this tricky to implement. Bookmarks are great when they are online on some server your phone connects to. But Yeti promised (actually, I did) to make them available offline. This is easy when it’s only a single device. Multiple devices is very tricky though and I did not want to spend time on a full fledged sync service. But, as always, I have it figured out. Mostly. I have a lot of testing pending on my end (automated and manual). Once those are through, the build will be a third ready. Why aren’t more RSS readers doing this? It may involve manual work (as in the case of Yeti) or some person smarter than I can figure out a contextual way to grab this information off the publisher’s website. Well, Yeti doesn’t have the time to wait for some popular app to do it. You’ll be able to browse articles by that particular author as well as read about the author towards the end of the article (if you enable it under settings, it’ll be off by default). I spoke about Realtime RSS here and I’m glad it all worked out to be simpler than I aniticipated. So to bring these advantages to you, I’m working out the interface and potential “fine grain” settings that you can tweak to get notifications about new articles from your favourite publishers. So the app itself isn’t delayed. It’s still on track according to my tracker (assuming it’s functioning correctly). What is delayed is the week 4 release. So week 5 will have things from both of these weeks. I moved things around so this will be a big release and I get more time to implement things a little better and make sure everything works smoothly for my wonderful alpha group (*cough* unlike a certain release cycle *cough*). Build 40 just went to all Alpha testers. Here’s the changelog. Unread feed. All your unread articles in one place. Changed article lists layout to accommodate better for accessibility preferences. List rendering in some cases where a single item had multiple components in it. Images & Galleries no longer overflow bounds of iPhone screens. I’ve added preliminary support for the Subscriber part of the WebSub1 protocol to the backend. This vastly improves how I fetch new articles. Currently, it’s only enabled for this blog. New publishers, you add to the service, which advertise their hubs will be automatically added. For all existing publishers, I’ll manually check and verify.